The Conference and Events Centre features three room types, ie large (for up to 65 people), medium (for up to 25 people) and small (for up to 20 people). Our licensed restaurant and bar can take care of all of your catering needs. Capital Gateway Motor Inn is set on large grounds and there is a grassed area the size of a football field in front of the units ideal for children and guests to enjoy. 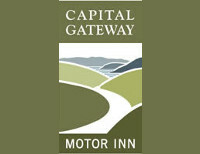 Capital Gateway Motor Inn is located just off State Highway 1. Access is clearly sign posted to the sweeping entrance way that leads to reception. Capital Gateway Motor Inn offers a quality and comfortable atmosphere located just 7 minutes away from Wellington City. We offer accommodation, conference facilities and a camper van park at affordable prices. Get in touch with us today for more information.